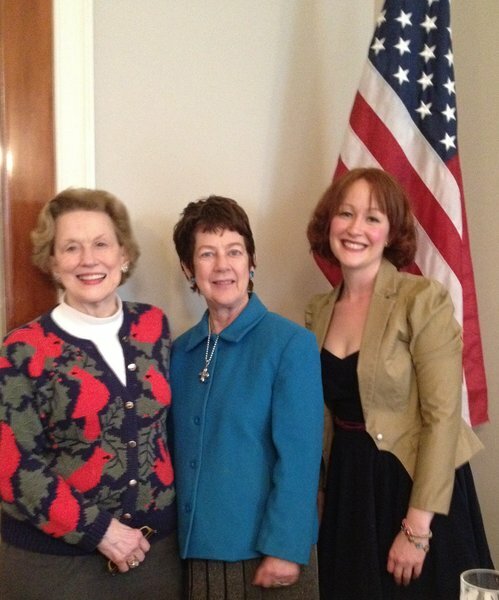 DAR Members Betty Woodruff, Hervie Folsom (event organizer) and myself (Eryn Oft). This month I was given the opportunity to serve as a Guest Lecturer at the luncheon for the Anniston Chapter of the Daughters of the American Revolution, commonly referred to as the DAR, on the music of early Colonial America. Before lecturing, the ladies allowed me to be part of their meeting and turn in my paperwork to become a member. Members have traced their genealogy to a soldier in the United States Revolutionary War. I am lucky my great aunt had already researched our family lineage. Following the opening ceremonies, which challenged my memory- with a recitation of “The Pledge of Allegiance”, the ladies and I talked of common interests, discussed their DAR charity work and ate fabulous lunches. On a deeper level, as I continue to read about the Arab Spring and the evolving role of women. I find I am inclined to stay involved in organizations that honor the history of the United States. I have been inspired by the women of Egypt who continue to fight for their rights and Hillary Clinton’s strong remarks regarding Egypt. “This systematic degradation of Egyptian women dishonors the revolution, disgraces the state and its uniform and is not worthy of a great people,” Mrs. Clinton in a speech at Georgetown University. Although the DAR needs to confirm my records and vote on allowing me to become a member- I feel a kinship with these women who continue to keep the history and the future of America strong.